What has holistic learning got to do with elephants? I’ve just come back from running two teacher education courses for pre-primary and primary teachers and trainers in Malaysia. As well as exploring the concept of holistic learning with delegates on the courses, I had an experience over my free weekend visiting the National Conservation Centre for Elephants near Kuala Lumpur which made me feel closer to understanding holistic learning in practice. I’ve always liked the topic of elephants (mainly because children do too) and have used them frequently in my teaching, from traditional rhymes, craft activities and stories about elephants with younger children, to texts comparing African and Asian elephants, and report sheets about elephants as endangered animals with upper primary. However, despite knowing things about elephants in a factual way, I’d never experienced elephants in a holistic way until this weekend. 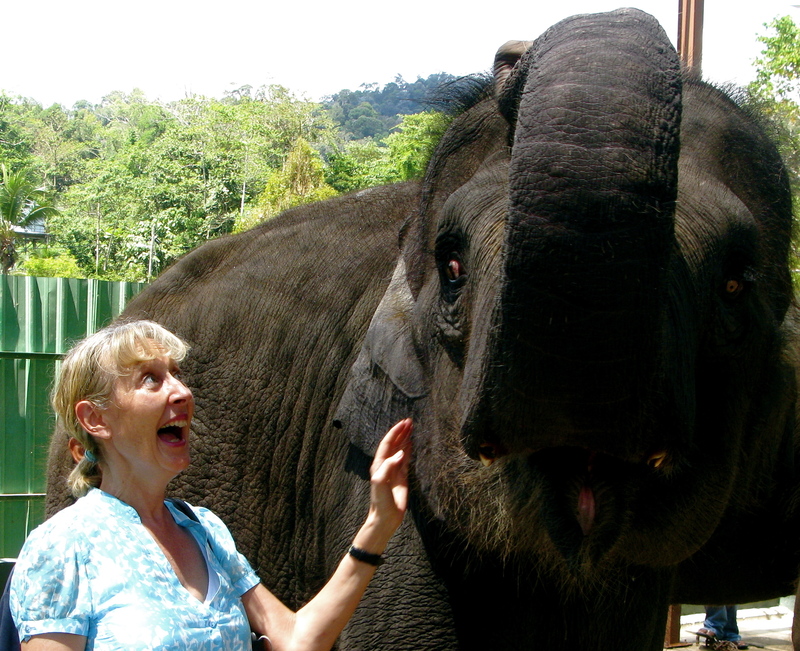 To give a few examples: I was amazed by the intensity of eye contact when you stand close to an elephant, as if they’re really sizing you up and considering you as a possible friend, or not. 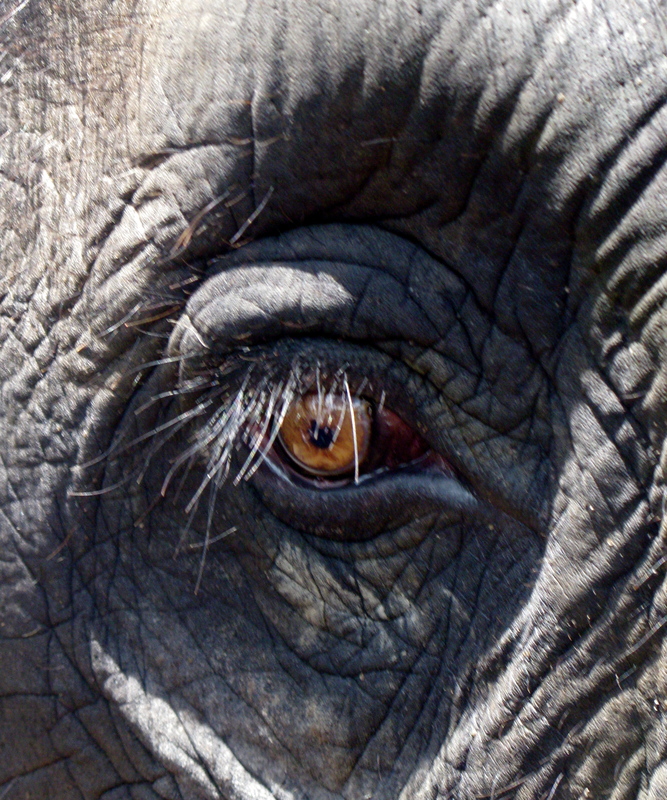 I was also impressed by the length and layers of some of the elephants’ beautiful eyelashes. Their skilled trunk-eye coordination in continual search for the 100 kilos of food they eat every day is astounding. The sinewy flexibility and delicately targeted suction power of their trunks is remarkable. The way they carefully break open tough trunks of felled banana trees with their feet in order to eat the most tender bits first before other elephants can get them is ingenious. And the hair on their heads, even on the very young, feels spiky and sharp like a hedgehog. Through rescuing and relocating wild elephants in over 4,000 square kilometres of protected rainforest, the Malaysian National Conservation Centre for Elephants programme combines saving an endangered species with an ecological agenda. 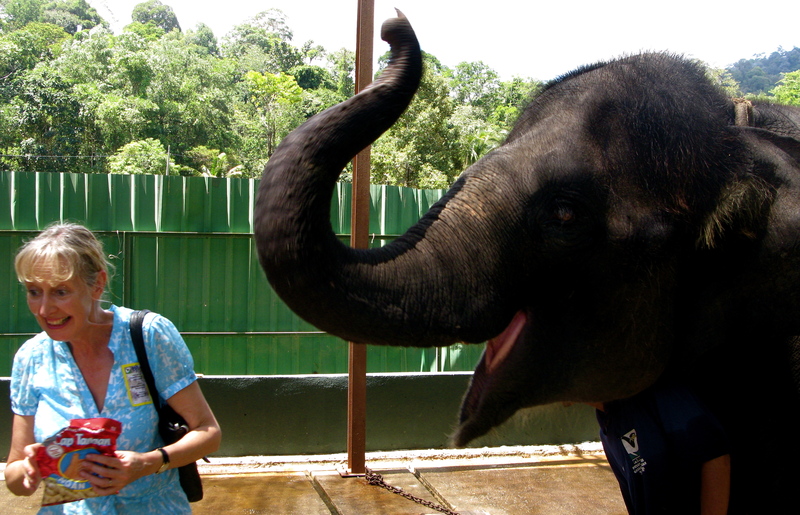 The educational, albeit touristy, experience offered to visitors of getting close to the elephants inspires an intense curiosity and interest in all aspects of their psychology and life style, their increasingly destroyed habitat, the reasons for the rescue operations that brought them to the Centre in the first place, and the overall impact the Centre has on the survival of elephants worldwide today. 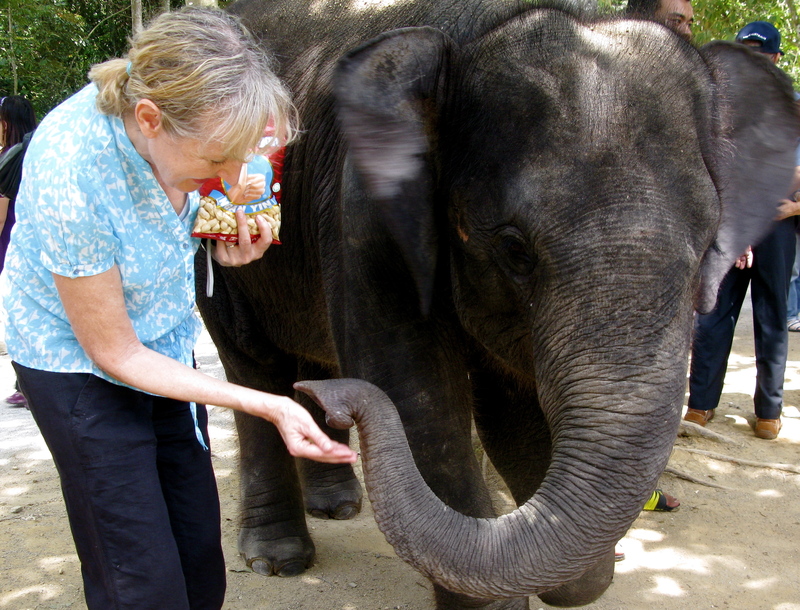 As I left the Centre to get a bus back to Kuala Lumpur, I couldn’t help reflecting that without the direct multi-sensory contact with the elephants, my interest would probably have been far less intense and the whole experience far less memorable – an analogy for the benefits of holistic learning perhaps? Holistic learning develops the ‘whole child’. The underlying philosophy is that through engaging children’s hearts, minds and bodies in active, experiential learning, children construct ever-expanding webs of understanding in relation to themselves, others and the world around them. Special importance is given to creating a positive relationship within each child to the overall learning situation. Children are encouraged to explore their feelings and given opportunities to respond in multi-sensory ways. This leads to the development of the imagination and a wide range of cognitive and metacognitive skills. The basic assumption is that learning is more effective when all aspects of the learner are involved. Getting young children to understand their world and use language in the way I felt I learnt about elephants that day feels a highly rewarding and worthwhile goal. What are your views? I’d love to hear! PS Holistic learning is an umbrella term which has a long and rich tradition in education and includes many well-known proponents such as Rudolf Steiner, Maria Montessori, Howard Gardner and Paulo Freire to name a few. The elephant photos are by Hannah Matthews who accompanied me on the trip and made it so much fun. In Portugal children learn about the planets in year 4. In an English course book called Hoola Hoop, they are also confronted with the topic of planets to provide a link between the English and mother tongue learning. A teacher using this course book came up to me excitedly and said how much the children loved this unit, not just because it was about planets, but because they saw photos of the planets in real life in the book. Even though they had studied planets in Portuguese, they had never seen real photos of the planets. It made so much more sense to them to see the real thing and not just illustrations. We can’t bring elephants or planets into our classes, and so we often substitute the real thing with illustrations. But bringing a photo is so much better. Providing different images of objects which are impossible to share in real life is far more motivating, and often overlooked. It contributes to a better understanding of what something is. Your photo of the elephant’s eyelashes gave us a very clear idea of what you were talking about. No illustration could have given us that understanding. Thanks so much for your response to the elephants! 🙂 And yes, it was a great trip. Thank you very much also for your example from Hoola Hoop of using photos rather than illustrations to make the topic of planets come alive with Year 4 children in Portugal. I completely agree with you that the use of photos can make the whole difference to engaging children with topics and content from other areas of the curriculum. There are also some lovely junior reference books, e.g. the Kingfisher series, which have beautiful photos and do this brilliantly. If possible, it also works really well if you can project the images using an IWB or powerpoint. And showing children extracts of e.g. National geographic DVDs or bits from Youtube related to specific topics can greatly increase their interest too. You’re so right about the elephant’s eyelashes – an illustration of an elephant with long eye lashes would just seem cartoony and unrealistic! Images can be so powerful and, as you say, are so often overlooked. Thanks again for writing and see you in Harrogate very soon! Lovely to hear from you and so glad the sessions helped boost confidence in the implementation of the new Language Arts component in the Malaysian curriculum. The tailor made CDs for English you mention sound great and the combination of imagery and sound effects a brilliant way to bring distant or abstract concepts ‘alive’ as well as meaningful and fun for the children.